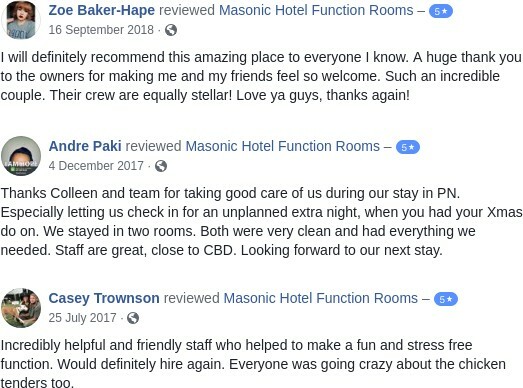 Masonic Hotel is located in Palmerston North, New Zealand, and provide accommodation, restaurant, bar, TAB and a function room. We are a family run business situated at 249 Main Street, Palmerston North, 5 minutes walk from the city centre, 2 minutes from our huge sports venue (Arena Manawatu), Rugby Museum, City Museum, Lido Aquatic Center and Esplanade Park - all within an easy walk. We have secure off street parking. Our friendly, efficient team will make your stay enjoyable. Like us on Facebook below!